The universe is a continuous web. Touch it at any point and the whole web quivers. In our daily life, we breathe, but we forget that we’re breathing. We bring our attention to our in-breath and our out-breath. Suddenly, we bring our body and our mind fully present in the here and now, and we smile. "Your invitation to follow the breath immediately set the tone for quiet and reflection. I particularly enjoyed listening to the many natural sounds that surround Spirit Mountain and, by stopping and listening, I was able to feel myself a part of it all." "Many thanks dear friends for another wonderful weekend! My deepest gratitude and heartfelt love to you for the beautiful space you have created. Truly a treasure!" "If you would have balance and order within, do one small thing at the same time each day with gratitude in your heart…"
"Courage and contentment are simply manifestations of the divine perfection that already exists with us all." "Try not to change the world. Fu-Ding Cheng facilitator draws upon Shamanic Wisdom Teachings to bring more wholesome and awakened masculine energies into men’s lives, their relationships and into the world. A great day! We are happy to offer online payments for programs and individual retreats at our Online Payment page. Provides physical, emotional and spiritual recovery for those who suffer from compulsive eating. Every other Wednesday, 10:00 a.m., April 24, May 8, May 22, June 5, June 19. For women who need a place to be validated and heal. Peer facilitated. Our Beacons of Light serve by holding the Net of Light steady. Beacons perform selfless service for the earth and all beings. At these meetings, you will hear inspirational and empowering messages given from the Grandmothers. For more information, please visit Net of Light website. Come laugh, share, and grow in this welcoming and supportive facilitated group for women writeres of all skill levels. Each week, writers write from prompts to help get their creative juices flowing, often creating unexpected and surprising results. Partial scholarships are often available for these retreats and workshops, although many are low cost or free. If you would like to apply for a scholarship, please contact Mary Morse via email or by phone at 951.659.2523. Cost is $190 and includes the materials cost for your drum and drum stick. $100 deposit must be received by Feb. 1 (so we can order the drum kits). Please register ASAP. Women Veterans with PTSD are invited to attend our four-day Resiliency Retreats that are offered at no cost scholarships through grant funding. Women will have a chance to grow and reconnect with themselves in a safe and supportive environment without having to relive any trauma, and learn some helpful skills in the beauty of the Southern California forest. Activities include: resiliency skills training, ceremony, journaling, meditation, equine (horse) therapy experiences, self-care, energy healing, and art-based experiences. Our beautiful contemplative garden is one of the featured gardens on the Tour. Save the Date: May 19th, 2019, 2-5 p.m. 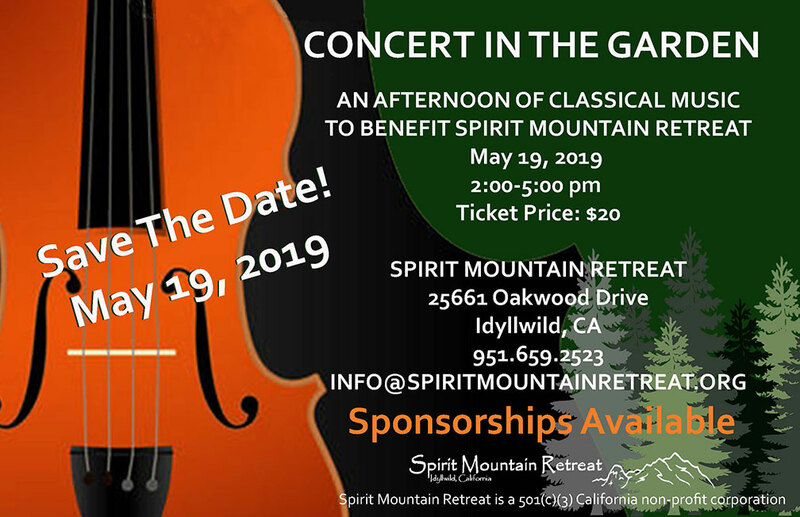 Spirit Mountain Retreat is a California 501(c)(3) non-profit organization. Your sponsorships and donations may be tax deductible in certain circumstances. Awaken to your inner story...attune to your life energy...ground awareness and commitment...enter into quiet reflection.